The dynamics of beer production and the trade balance took downslope as early as in July 2012 and till May 2013 was pronouncedly negative. However, the stabilization that appeared in June turned out to be very short-lived, and the sales season was distinctly unsuccessful. Brewers’ prospects for 2014 look a little bit better, though they do not raise a particular optimism either. Let us analyze the main facts, effecting Russian beer market in 2013. The main pressure on beer consumption was exerted by the ban on beer trading in kiosks. According to different estimates, nonstationary outlets accounted for ..-..% of beer sales. In natural terms, this realization volume comprised nearly ... mln dal of beer. The tendency in favor of “modern” retail as compared to the traditional one has been observed for a long time. But the market turned out to be not ready to face closure of some of the traditional sales channels. It is notable that the introduction of the first stage of the prohibition in July 2012 marked the start of protracted production and sales decline. In January 2013, when beer realization in nonstationary outlets was completely banned, the rates of the decline became double-digit. According to a survey carried out by Sberbank СIB in March-May 2013, some kiosk continued selling beer, as .% of the respondents still bought beer in kiosks, despite the prohibition introduced in January. However, a year ago this index reached ..%, which means that there has formed a tendency of kiosk consumers switching to the modern formats of retail. The conducted analysis reveals that ..% of the respondents, who previously bought beer in kiosks, are now buying it in retail network Magnit, ..% at stores Pyatyorochka and .% at stores of Diksy Group (including Victoria). Among non-public retail companies Ashan rated first with its .% of buyers. The consumers share, buying beer mainly at supermarkets and hypermarkets, in 2013 grew to ..% from ..% in 2012 and stores “nearby” saw their share grow from ..% to ..%. This ratio in general does not correspond to the sales allocation of all goods by the retail channels. If we take the consumption in general, the modern network trade accounts for ..% of purchases. That is, the liquidation of kiosks as a channel of impulse beer purchases reduced the frequency of beer consumption of those people, who bought beer spontaneously and do not wish to make a long way from home to buy a bottle of beer. The data on beer consumption reduction were cited by Sberbank СIB research, which revealed that more than half of consumers (..%) did not cut their expenses for beer, ..% cut their expenses partially, and only ..% of the respondents said that they started spending a great deal less on beer. Obviously, after prohibition to sell beer in kiosks, retail network and traditional stores have not become the only place of beer outlets. Over the recent ten years, Russia has observed development of new outlet format, namely, draught beer shops. The number of specialized outlets and high level of coverage in many cities have turned these draught shops into an alternative to kiosks. In the specialized beer outlets regional brands are usually represented, and their buyers have a good handle in beer flavors, preferring alternative and fresh beer to mass brands with a long shelf life. Beer shops gave a good support to regional brewers during the economic recession 2008, as they did in the difficult year of 2013. Many independent breweries currently focus on beer output in kegs, and beer shops in the domestic area and even in the distant regions have become the key selling direction. If not for the specialized retail, the development of small scale brewing would have been much slower as because of the narrow HoReCa segment, they would have had no outlets. Accordingly, the significance of draught beer shops is inversely proportional to the scale of brewing enterprise. The historical homeland of draught beer shops is the Siberia. In the period of market consolidation, local brewers better than other regional players retained their positions despite the pressure from the international companies. However, though they had loyal consumers and low prices, their selling channels were ever narrowing. The conditions of major networks were often unacceptable for medium size brewery, and the shelf space of many supermarkets was the competition field to the market leaders exclusively. That is why, the explosive development of the network retail, though promoting market growth in general, brought little good to regional brewers. The first shops selling draught beer appeared in Novosibirsk in mid 90-ies, which was actually the time when Russian breweries started produce beer in kegs. The number of beer shops in Novosibirsk and other cities of the regions was increasing over the years, but just ten years ago, it was rather a local phenomenon, resulting from stable preferences of the local beer lovers. Inventing device for foamless filling by Novosibirskprodmash (NPM-Group) in 2004 turned out to be a serious growth driver. Its production launch allowed shops to increase their turnover speeding the process of beer filling by several times. Before 2005, in Russian market in general the significance of beer shops, as a market outlet, approached zero. In Moscow and Saint Petersburg the first specialized shops started springing up in 2006-2007 and were quite successful. Many entrepreneurs and businessmen were inspired by the high profitability against the background of low competitions. The economic recession somewhat drew the interest from private investments, but as early as 2009-2010 there started a boom of beer shops, and networks gained power. And currently in big cities the competition is the fiercest among shop networks and not among separate outlets. For example in beer capital, Saint Petersburg, company Magazin Piva was the first one to enter the segment of specialized trade, and in 2006 it started a network of same-name outlets. In 2008-2009 it was joined by network Lit.ra, Pivnaya lavka, Beeromania, Khmelnov, Pivas, Tuher House as well as beer shops PivO’Beer, Pivnaya Karta, Beeroman and so on. A range of them specialized in “live” beer by local producers, and some focused on import draught beer. Late in 2009 there was nearly .. outlets of draught beer in the city (estimate by “Expert Severo-Zapad”), ... outlets in 2012 and ... beer shops in April 2014 (estimation base on 2GIS data). We should note that Novosibirsk, which has quite a developed specialized retail, also saw a rapid growth during the period of explosive development of the “live” beer market. Thus, according to 2GIS census, early in 2010 there were ... draught beer shops in the city. In 2012 their number reached ..., and ... outlets in April 2014. The total of . ... draught beer outlets operates on Russia, i.e. in .. cities and adjusting population areas. Certainly, the estimates before 2013 did not take into consideration kiosks, which also worked in the draught format. But due to the prohibition of beer realization in nonstationary objects, today this number approached the factual one. The considerable growth of outlet number against 2012 can be explained by the prohibition introduction, as well by including the shops, which could have been overseen by 2GIS, and by wider geography at the account of neighboring populated places. Our estimation accounted nearly ..% of population of city Russia and nearly ..% Russia in general. That is, the majority of medium cities (50-100 thousand people) and small towns (up to 50 thousand people) were not taken into consideration. However, it is difficult to organize keg beer logistics in rural areas and the number of shops in small populated places is usually low. One can presume that the total number of draught beer outlets in Russia comprises nearly .. ..., not including supermarkets. If we consider the average sale volume of one outlet to equal 45 000 l of beer per year, the total beer volume sold by specialized shops will amount to .. mln dal or .% of Russian beer market. On the average for 86 populated places of Russia the number of draught beer shops grew to .. per 100 000 people by April 2014. The biggest relative number of outlets belongs to three Siberian cities, namely, Kemerovo, Barnaul and Novosibirsk where the average shop number equals .., .. and .. per 100 000 people. Accordingly, the Siberia leads Russia regions in the relative number of establishments. The last position here is occupied by the regions with developed network retail, namely, Central and Northwest Regions. By the absolute number of draught beer shops, Moscow is the unchallenged leader, with its .... draught beer shops. Novosibirsk has half as many outlets and in Saint Petersburg there are ..., the Siberia is again the leader among the regions as there are . ... shops of draught beer. Central Region is the second by the shops number (. ...), and Volga Region occupies the third position having . ... shops. The main risks of the draught beer shops segment lie in the stiffening state regulation. For example, the local authorities in Samara and Sverdlovsk regions prepared a lawsuit to prohibit selling alcohol products at places located in nonresidential premises of apartment blocks. Besides, there are initiatives to expend the minimum trading areas of a shop, to prohibit beer shops if their entrance is located on the housefront. After May holidays State Duma will consider a package of bills concerning limitations of alcohol sales, with a provision of ban on sales at shops on the ground floors of apartment blocks. This motion is included into amendments worked out by legislative meeting of Penza Oblast, as it is written in the “Russian newspaper”. The authors of the lawsuit suggest passing the regional authorities the right to prohibit retail trade of alcohol on the ground floors of houses. The amendments were worked out following numerous complaints from residents, concerning noise and breach of peace by such shops clients, as is stated in the below given explanatory note. These limitations, if introduced, are likely to considerably cut beer outlet number, many of which are located in apartment blocks. Beer moving from kiosks to networks had a negative impact on brewers’ sale profitability. During the conference for Carlsberg Group investors, dedicated to the results of 2013, Jorgen Buhl Rasmussen told about much higher pressure on pricing from the modern trade, as compared to the previous year. The same pressure is experienced by other market players. This trend is reflected in the official statistics of Russian producer’s price. By the season of 2013, Russian brewers raised producer’s prices in order to offset the lingering sale decline, as they did in 2012. That is why the leap was unprecedented, that is, from April till May 2013 the cost prices grew by ..%, up to ..... ruble for a litre. This rise was prefaced by a long period of retaining and subsequent winter price decline, which offset the excise rise. But the retail beer price went on growing dynamically. As it was last year, after the price rise, there was a period of relative stability till the season end, but after a slight growth in October, the price plummeted to the record for recent years minimum, which again made the excise rise offset possible. And again, this did not have much influence on practically linear growth of retail prices. This process yielded considerable margin increase to the trade. By December 2013, it reached ..%. Notably, beside the immediate impact of excises, the price downturn could be associated with the necessity to load the warehouses of distributors and traders expecting the period of low demand in winter due to overproduction. Let us consider the dynamics of producer’s prices, on the example of separate companies, basing on the regional statistics. The above described processes were in general in tune with the price policy of Carlsberg Group, which, being the market leader, determined all-Russia trends. If we take the beginning of 2012 as the base, by February 2014, the company has raised prices by ..%, if we rely on the regional statistics. We also have to say that the price policy of AB InBev was rather restrained too, as the enterprise obviously tried to stop its rapid market share fall. Compared to the base we accepted, the growth was not big and reached about .%. The dynamics of price growth at Efes enterprises varied a great deal, which was obviously connected to the process of transiting the production from closed Moscow branch to other regions. Thus for instance, beer price grew sharply in Kaluga (nearly ..%) and considerably in Ulyanovsk (nearly ..%), which can be explained by production reallocation of license and premium brands. At the same time, the brewery in Tatarstan Republic has obviously entered the competitive battle, that is, the decline of the producer’s price was drawing upon ..%. Independent beer producers had different approaches in forming their price policy. In general, it can be attributed to different distribution channels. Many rather big enterprises, such as Ochakovo, Tomskoe pivo, Deka and brewers from Stavropol and Ryazan, kept the cost price growth down. They operate in the same competition and retail field as international companies, suggesting an alternative to mass brand, but they are still more focused on the economy segment of the market. 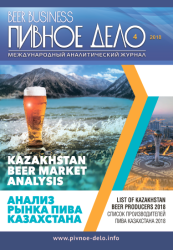 Comparatively small enterprises or those that are mainly focused on specialized retail and operate in the format of draught beer, for example, Ayan, Altai brewers and many others were increasing prices perceptibly. Besides, under our estimate, cost prices of Moscow brewing company grew substantially. At the same time, all the producer’s price fluctuations rather served like a buffer for the traders’ margin, than determined the final retail prices. Their fluctuations mostly depended on the food prices index and if not completely reflected them, at least coincided with them occasionally. Following the common dynamics, the growth rates of beer price were higher than those of the food prices. The income level of consumers and their sentiment are usually measured basing on the official statistics. However, as a part of Russians’ income is not included into statistics, data by independent companies are currently often used in order to evaluate the consumer activity. If we match data by research company Romir on consumer sentiment and the trade balance dynamics, it will be difficult to track the connection between the buyer activity index (BAI)* and the beer market, till recently they rather were in opposite phase. Though for example in Ukraine such connection is obvious. Lack of correlation can be explained by the saturation of Russian beer market and strong impact of the weather and state regulation. However, there are preconditions for influence on the market of the factors, connected to the general production consumption. At least, such influence is already pointed out in the reports of international brewing companies. * Romir buyer activity index is an instrument for evaluation of the consumer reality, devised basing on household scan-panel of Romir Household Panel. It shows the consumption dynamics of basic goods and prices, qualitative and quantitative composition of household consumption and changes in preference of purchase locations of Russian city dwellers. The index calculation is based on daily undated information on more than 100 categories of grocery and non-grocery goods in Russian cities with population of 100 000 people and more. According to the data by Romir, 2013 started with expansion of everyday consumer expenses of Russians, partially due to natural sale growth of grocery and non-grocery goods, and partially due to the trend of buying more expensive goods. And up to the end of high beer sale season, there was a slower but positive dynamics of consumer activity index. However, in September analytics of Romir started speaking positively of the new trend to cut expenses on household grocery goods and significantly increase expenses on non-grocery goods. Expenses on food decreased mainly by switching to more “budget-friendly” goods. Consumers started to pay more attention to various “special offers” and “bonuses” by retail networks. Over the months they would go to (purchase from) more outlets than before, looking for the most interesting (cheapest) offers and trying to avoid impulse purchases. Obviously, beer is not a basic good and in spite of the adjustment to new trade rules, consumers were buying less beer than previous year. In this connection we expect the competition to become fiercer between producers and retail networks for a consumer who is able to pay but rather economical and rational on the one hand, and on the other hand, producers and retail will fight for decreasing margin. Since October 2013, the consumer expenses stopped growing (against the corresponding period of the previous year). Consumption was decreased both by low-income and by middle class buyers who thought about credit reimbursement and currency purchase. After ten years of nominal (and actual) growth, the Russian food market and market of everyday goods in general has approached saturation. Though the beer market had seen it long ago, in 2008. Let us note that nowadays, beer takes up a considerable share of Russians’ net expenses on foods and services. By the way, Russians spend about ..% of their income on foods and services. The share of beer was estimated at ....% by Rosstat when evaluating the structure of consumer expenses of population in order to calculate the index of consumer prices in 2013. Under our assessment, this percentage roughly equals . ... rub. per year. The share of beer is quite considerable, as to the total, ....% of per capita incomes is spent on grocery goods. The expenses on beer are comparable to those on wine, and ..% less than Russians’ expenses on vodka. And much more is spent on beer than on water and other alcohol-free beverages including juices, expenses on them amount to ....%. In order to give prognoses concerning the market dynamics in 2014, one has to keep in mind the conditions of the previous year. The previous season was in general favorable for beer sales, so if we consider weather as an independent factor, the base of 2013 was high. Thus, according to report by RosHydroMet, 2013 was very warm and the average yearly air temperature for RF in 2013 exceeded the average (average for 1961-1990) by 1.52°С (6th indicator since 1936), which is by 0.45°С higher than the temperature of 2012. March of 2013 was very cold on virtually all territory of Russia (see weather chart of RosHydroMet), however this month is of little importance for beer market, owing to sharp seasonality of sales. Instead, the weather from April till August made brewers quite glad. This does not concern several Siberia regions, where weather was rather cold in May-June. Besides, in European and Black Earth region and in the western Siberia there was totally rainy weather. Apart from the warm summer, a bonus awaited brewers at the end of the season of sales. After neutral by temperature September and moderately warm October, the autumn decided to stay for a while and November was extremely “hot”, and many regions beat records of temperature anomalies. The warm autumn, in spite of the consumer spending reduction, surely impacted the beer market dynamics, which was positive from September till November. Over the recent years climatologists have been returning to the formed trend of the country-wide warming. The growth rate of Russian temperature yearly average (linear trend) reached 0.43°С/10 years. The fastest growth is observed in spring and autumn, but due to interannual fluctuations, the trend is mostly pronounced in summer (0.44°С/10 years). Relying on this trend, one can expect a neutral or moderately negative impact of the weather base of the last year on the beer sales dynamics of 2014. The positive influence is obvious in March (because of cold March in 2013) and probable in May (because of heavy precipitations). The base in November will be very negative, as it is not likely to be so warm in 2014 too. In 2013 negative inner factors led to beer production decline by .% to ..... mln dal according to Rosstat data. And the beer export from Russia declined by ...% to ..... mln dal, while the import shrank by ....% to .... mln dal, mainly due to cutting deliveries from Ukraine. As a result, the trade balance, which roughly corresponds to the size of Russian beer market, has seen a ...% decrease to ..... mln dal. According to our rough estimation, at the end of 2012, nearly .. mln dal of beer was produced, which can be considered an excess volume, intended for sale in 2013. Thus, the brewers can somehow mitigate the excise rise, which takes place at the start of the year. At their turn, the excess volumes at the end of 2013 amounted to nearly .. mln dal. Accordingly, the corrected trade balance, which can be considered equaling the market, decreased by ...% to ..... mln dal. Basing on the average producer prices, one can calculate the revenue of brewers. In 2013, it shrank by ...% to ... bln rub or, as a result of ruble devaluation, by ...% to $... bln. The main decline took place during the first half of the year, when the sales dynamics was sharply negative too. The beer market by value*, if we base on our estimations of the trade balance and Rosstat data on retail price dynamics for the domestic and import beer, in 2013 grew only by ...% to ... bln rub. This is a very low growth rate, as in 2012 the beer sales grew by ...%. * One should keep in mind that the market volume in monetary terms is an imputed value, as nearly 9% of beer is sold in HoReCa, where the trade markup can vary, but as a rule, it is much lower. As the ruble rate in 2013 declined against 2012, in dollars the beer market fell by ...%, having comprised $.... bln. 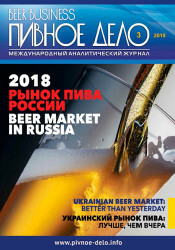 In the recent years, the competitive situation on the beer market has undergone changes, as well as the preferences of Russian beer consumers. In the context of competition of the leading producers, apparent redistribution of positions could be observed. At the same time, the pendulum swung in favor of big federal companies, which had been rapidly gaining market weight till 2007, and seemed to absolutely dominate the market. Loss of stability by many Russian mass brands has formed into a tendency. And on the contrary, beers of medium and small producers, are gaining market weight. The emphasis is no longer placed on “live” beer, which was an attempt of medium breweries to distance themselves at the first stage of their recovery. Neither the focus is made on “craft” beer by small producers, which account for only several per cent of the market, and do not have a serious impact on the market volumes. Beer lovers seem to be a little tired of standard flavors and many variations of mass brands and aggressively swanky advertising campaigns. However, the total prohibition for advertisement outside supermarkets draws the flavor, package, and the product identity to the foreground. Consumer now pays more attention to the location of production and the history of a certain product. This is reflected in the popularity growth of more expensive brands, local, so called “nostalgic” sorts, craft and draught beer. The branding activity of transnational brewing companies was accordingly revised, to the direction of product range changing, simulating regional breweries or even mini-breweries. This trend led to degradation of the “old” economy national brands and made brewers think about the potential of regional sorts scaling. There appeared brands without distinct geographical identity in Russia, but with limited distribution. For example, Carlsberg Group late in 2012 launched a new rice beer Dragon, brewed by “Asian formula” especially for Far East of Russia. In 2014 AB InBev endorsed the idea by producing Chinese rice beer Dao. In 2013 beer Sarbast migrated from closed Uzbek subdivision of Carlsberg Group. This brand was bottled by Samara subdivision of Baltika and distributed in Tatarstan and Bashkortostan. Obviously, such launches can be called pilot market projects, before development of distribution in other regions. While in 2009 the aggregate market share of the leading four producers comprised ..%, by 2013 it went . p.p. down, having amounted to ..%. By volume TOP-4 companies over this period cut their beer sales by ..% to ... mln dal. Instead, since 2008 independent and regional producers as well as import together have raised their sales by ..% to ... mln dal. Thus, currently as much as ..% of beer is produced by medium sized companies (usually regional) or is imported from abroad. Despite the growing share of independent producers, we cannot that all them rosper, as the aggregate volumes of sales have been shrinking slowly since 2012. Instead, inside the segment significant changes are taking place. Despite the redistribution of sales in favor of independent companies, in 2011 Baltika stopped losing its positions and has been gradually increasing its market share ever since. This means that compared to the immediate competitors, the company’s performance look relatively good and better than the market in general. According to Carlsberg Group report, in 2013 its Russian subdivision cut deliveries by .% while the market fell by .%. According to the company estimation the decline was mainly due to the aforementioned outlet restrictions which were further compounded by a slowdown of Russian economy growth and consumer sentiment in the second half of the year. The influence of the annual strategy to produce excess volumes in order to overstock the distributors’ warehouses before the excise rise was limited. Obviously, this means that the excess volumes were the same as last year and the .% decline reflects the sale volume change in retail. The report for 2013 states that the company improved our market share in both the modern and traditional trade, and across most Russian regions, with particularly strong performances in the super-premium and mainstream segments. Brands such as Baltika 0, Baltika Cooler, Zatecky Gus, Holsten and Zhigulevskoe performed particularly well, while Baltika 7 was negatively impacted by outlet restrictions. “The level of commercial activities remained high in Russia. Several line extensions of Baltika, such as Baltika Praha and Baltika Munchen, were launched, and we introduced Grimbergen with good results. In addition, for much of the year the sponsorships of the Sochi Olympic Games and the Russian National Hockey League were being activated. The launch of the rejuvenated Tuborg was an important step in strengthening Tuborg’s very strong brand equity in the superpremium category. We achieved price/mix of +.%, positively impacted by price increases in March, May, June and September but offset by the Russian excise tax increase and a negative mix. Price/mix dynamics improved in the second half of 2013”. The regional dynamics of beer production at different branches of Baltika was very inhomogeneous. In European part of Russia the company unexpectedly demonstrated high growth of beer output. Thus, under our estimation, Tula branch of Baltika increased its production by ..% to .. mln dal, at Voronezh brewery the growth reached ..% to .. mln dal and .% to .. mld dal in Yaroslavl. But at the east of the country, on the contrary, there was a shar fall. Under our assessment, in 2013 Chelyabinsk branch of Baltika cut its output by ..% to .. mln dal, Krasnoyarsk experienced a fall by ..% to .. mln dal and Khabarosk branch – by ..% to .. mln dal. By the moment of the article preparation, Baltika summarized the first quarter of 2014. Under company estimations, Russian beer market shrank by .% against the previous year due to kiosks prohibition, macroeconomic environment and poor economic growth. Besides, the financial performance of the company in the first quarter was negatively impacted by Russian ruble weakening. “As for the market share, the positive tendency of the previous periods was preserved, that is, over the first quarter the company share grew to ....% according to Nielsen data. In the current difficult economic conditions, which are negatively influencing consumer’s sentiment, Baltika manages to sustain its leadership on the market. The most significant share growth was demonstrated by brands Baltika (+...%), as well as by recently included into the portfolio brands Koff and Karmi. A small contribution into the common result of the modern trade was made by the region Ural-Povolzhye, and North-West region in the channel of the traditional trade. In total, Carlsberg Group performance showed organic growth of the total profit by .% and the growth of price/mix by .%. The international group portfolio has continued growing, and the best performance was demonstrated by Tuborg (+..%) and Somersby (+..%). Brand Carlsberg grew by .% on its premium markets”. According to the report by AB InBev, the volume of Russian sales in 2013 fell by ....% to ...... mln dal, due to the general situation aggrevation in the industry and decline of the market share in the low-price segment in the contest of the chosen premiumization strategy. We should say that the positions of Russian AB InBev subdivisions have been worsening since 2009. During this time, the company share under our assessment has fallen by ... p.p. However, Baltika in percent points has lost much more, but in view of the activity scales, one can say that AB InBev losses on Russian market were bigger than those of other transnational companies. In order to gain insight into the preconditions for the outrunning loss of market share, it is necessary to switch at the global level of AB InBev activity. In our view, there were two reasons for the rapid loss of the company market share. Firstly, in the course of so many mergers and acquisitions, the scale of AB InBev activity has increased sharply and the company global priorities have changed significantly. In 2007 before the main merger, Russian share in the total volume of InBev beer sales comprised ...%. By the end of 2013, AB InBev share of Russia amounted to ...% and ...% in the total volume of beverage sales. The main sale volume in region “Europe” accrues to other countries. For comparison, the share of Russia in the global sale volume of Carlsberg Group according to our estimation amounts to ..%, while for Efes it equals ..% of international subdivision sales and ..% of beer sales in general. In other words, AB InBev shareholders, unlike the competitors’ shareholders, are very little worried by the troubles on Russian markets. The funds are directed to acquisitions of perspective companies in perspective regions, as well as to pay the debts of the previous acquisitions. 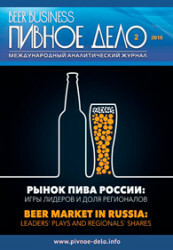 The company is obviously not ready to enter the competition on the falling and losing profitability Russian beer market. Secondly, since AB InBev is now headed by a first class financier Carlos Brito, the emphasis is made on profitability via price increase and cost reduction. Globally, there have been selected three key brands, which have been receiving investments from the company, namely, Budweiser (Bud in Russia), Corona Extra and Stella Artois. At the international level there are still old brands of InBev, they are Beck's, Hoegaarden and Leffe, but they are rapidly losing their significance. And finally, local brands are as much interesting to the company as they are profitable. As we mentioned above, AB InBev is not trying to compete in the segments with low mark up. But increasing profitability by market share expansion has been in process for a long time, since 2007 (it was otherwise till then). The point is that as there appeared other options such as regional producers and draught beer segment, economy sorts of AB InBev with an extra charge “for brand” became not attractive to the consumer. Under the pressure from Baltika company, AB InBev was slowly losing its positions in the blurred mainstream segment, and not paying so much attention to local brands development as its competitors. It must be the impact of the strict expense control. AB InBev sales volume, if we base on the peak year of 2008 and use the data from yearly reports, fell by ..% while the market in general went ..% down over this time. By implementing the chosen strategy, that is premiumization and expense cutting, the company was acting radically. Almost every year, AB InBev closed breweries – in Saint Petersburg in 2010, in Kursk in 2012, in Novocheboksarsk (Chuvash Republic) in 2013 and in Perm in 2014. By redistributing production volumes by different subdivisions AB InBev managed to avoid production decline at some of them. Thus, according to our estimation, the biggest company brewery in Omsk retained the output volumes at the level of .. mln dal, and the output at Saransk subdivision (Republic of Mordovia) remained at the level of .. mln dal. At the same time the breweries of the Central region were still rapidly reducing the output volumes, for instance, Ivanovo subdivision under our estimation, cut the production by ..% to ... ml dal. Judging by the regional statistics data, Klin subdivision also experienced a considerable decline. Following the strategy of premiumization and global brands development, over 2013 AB InBev was actively investing into beer Bud promotion, which yielded bigger volumes and, accordingly, bigger sales share of the brand. Besides, the launch of brand Tinkoff Avtorskoye proves that within the chosen strategy AB InBev is striving to adjust to new conditions and produce niche “craft” beer. This launch cannot be called important for the company, due to very high retail price of the brand, which is by the way, going down. The second launch of a craft-like sort “Sibirskaya Korona. Tri Khmelya” also possesses all attributes –unfiltered beer in bottle of non-standard volume and shape. But this launch targets a perceivable sale volume generation, as the sort price is at the level with the brand range. So far the new launches have not slowed the company sale decline, which is outrunning the market decline. According to AB InBev report for the first quarter of 2014, the company sale volumes are now even farther behind the market, having shrank by ..%, even though the company managed to expand its share in the premium and superpremium segments, in particular, due to Bud brand. In the new season, the company is still strongly focused on the global brands, thus in February-March 2014 the company started outputting alcohol free sort Bud Alcohol Free. Besides, as one could expect, the distribution of the company’s global brand Corona Extra came over to the new owner from Carlsberg Group. This brand is well known to Russian consumer, but its development has been so far unstable. Most likely, in the nearest future, Corona will occupy the top price segment in Russian portfolio of AB InBev (which means it will not get cheaper) and, will probably increase its market share due to the company’s developed distribution network. Besides, AB InBev, following the trend to produce sorts with pronounced identity, launched “Chinese” beer to the market. The price of beer Dao corresponds to the border between the mainstream and Premium segments. “Currently in the eastern part of Russia, particularly, very close to China, Chinese rice beer is growing more and more popular. Our consumers are offered an alternative of Russian rice beer, which not only matches Chinese beer by flavour, but is much more cost saving” – writes press release of the company. We should say that the idea of AB InBev is not so original, as in 2010 Irkutsk mini-brewery produced bottle beer Dao brewed under Chinese technologies. According to Heineken report, in 2013 the company managed to increase the market shares by volume and value. Under our rough estimation, the sales volume of the company declined by .%, having amounted to ... mln dal. This is the best performance among transnational companies. Russian market is rather important for Heineken as .% of the total sales by volume accrues to it. At the same time, the growth and profitability of company sales are now provided by other regions. Heineken was demonstrating comparative stabilization of performance starting from 2010, as the company managed to follow the consumer trends. The main weight of natural volumes was given by Zhigulevskoye and .. regional brands, which loaded the production at all of the company’s eight subdivisions. In this way the company reacted to the growing beer patriotism and the dynamic development of draught beer segment. For example, major Siberian independent producer, company Tomskoe Pivo, pointed out the vast number of local producers and weak positions of federal companies, when assessing the competition on the domestic market of keg beer. At the same time, among its geographically close competitors Tomskoe Pivo emphasized two Altai enterprises and Heineken. In the regions, where the beer sales structure is dominated by packed beer, which is sold via the traditional and network trade, Heineken also offered its affordable regional alternative. For example, in distant Kaliningrad region, where brewing production of the company is located, it controls almost a half of the market, both due to federal brands and two regional sorts. At the same time, national brands, namely, premium Zlaty Bazant and Dr. Diesel, which have been expanded by a variety of flavours over the recent years, mainstream beer “Ohota” and economy “Tri Medvedya” have obviously to full extent experienced all negative impacts of beer markets. For instance, when describing the results of 2013, it was stated that the reduction of sales volume of Heineken in Russia was caused by lower demand for key brands and brands of economy segment, which was only partially offset by sustainable growth of brand Heineken. The general figures of the portfolio range and profits calculated by hectolitre demonstrated positive dynamics, which provides for the strategy fulfillment to promote revenue growth in the region. In the first quarter of 2014, the calm optimism of the previous years was shadowed by a negative report. According to Heineken report, the situation on Russian beer production market is still difficult, which resulted in more than ..% loss of the company sales volume, that is, the company’s sales were falling … times faster than the market. Speaking with investors, Rene Hooft Graafland, CFO, talked about the selling prices of Heineken in Russia. “In Russia pricing - well first of all again excise increase 1st of January, you see a market that's relatively soft, so in decline high single digit, that is also what we expect for the full year. Pricing is still not very positive. We have taken price only in March now we see that part of the competition has not taken price. Overall you need much more to offset that excise increase. So the negative pricing environment continues in Russia, but we will do everything to take wherever possible to take price. What we see in Russia on the positive side is that we are now really - we are now for a couple of years very much focused on the top end of our portfolio. So the higher value brands and we saw that last year working out very well and we see that continuing in the first quarter... So we get a stronger and better portfolio in Russia and that should help build the margins, which we have said on many occasions are below standards. So we need to go for margin improvement, the environment is not helping, the pricing environment is not helping, but our strategy is a solid one to build that”. We should also add that, data from the market auditing reflect an outrunning growth of the market prices for Heineken production starting from the third quarter 2013 *. This growth is particularly evident against the background of the soft price policy of the company during the previous years. Company Efes has been rapidly losing its market share since the acquiring SABMiller assets, and in 2012 lost 2nd position in the list of the leading brewing companies. Under our estimates, simple summing of companies’ shares in 2011 gave about ..% of the market to Efes and SABMiller, and in 2013 the share of the joined company equaled nearly ..%. Thus, the integration cannot be referred to as successful, regarding the sales volume. In 2013, they saw a ..% reduction to ... mln dal, according to our calculation assessment. This was the most dramatic fall among all international companies. The joined portfolio of Efes and SABMiller brands looks too big now, taking into consideration the market decline and no possibilities for effective promotion. Competition for the shelves between rivals as within own shelf space would inevitably lead to market share decline, all other conditions being equal. An important reason for volume reduction was temporal halt in SABMiller production sales in the network retail, owing to integration processes, as the contracts with supermarkets had to be concluded again. The company announces to have concluded new contracts with the retail within 2013. But this process was obviously difficult, as today all big companies are actively fighting for shelf space in the network retail. The existing sale system provides for offsetting for short –received profits to supermarkets in case some of brands, sorts or formats do not provide the planned margins. Obviously, Efes has to restrict distribution and the shelf share of low margin or competing products, in order to preserve necessary profitability. This process is aggravated by unbalanced structure of retail sales of the company. According to Efes report for 2013 a comparatively big share of company sales accrues to the traditional retail, while the kiosks were till the recent time one of the biggest channels of the traditional retail. That is why the ban on beer sales in non-stationary objects affected Efes more than other market players. Shot-down of two Efes subdivisions became a logic sequence of the integration processes, against the background of the lingering decline and the necessity to control profitability. In 2013 the plant in Rostov was closed, as well as Moscow brewery early in 2014, which had been the starting point of the company operation in Russia. The both breweries had a great deal smaller capacity and were less modern than SABMiller breweries in Kaluga and Ulyanovsk. However Kaluga enterprise was traditionally focused on production sales to Moscow. The regional statistics of beer production generally reflects the same negative trends of 2013. A decline of nearly ..% was observed in all regions where Efes breweries are operating (or used to operate) except for the biggest Kazan subdivision, as there the decline of the output volumes comprised .% under our estimation. However, judging by the company report concerning the results of 1 quarter 2014, the integration processes at the local levels are finally completed and exhausted their negative effect. “We had a solid start to 2014 and consolidated sales volume of our international beer operations rose by ....% to ... mhl in the first quarter of 2014 compared to the same quarter of the previous year. In our largest market Russia, our volume performance was better than our expectations due to brand initiatives as well as better execution, supporting overall performance of EBI. However, more importantly, our brand initiatives proved to be successful across the region and contributed to our outperformance compared to our expectations. EBI’s sales revenues were flattish at USD..... million in the first quarter of 2014, compared to USD..... million in 1Q2013. Despite local price increases during the quarter in addition to the rise in volumes, the improvement in EBI’s sales revenues was negatively impacted in USD terms mainly due to the weaker Ruble against USD. EBI’s gross profit rose by ...% y-o-y and reached USD.... million in the first quarter of 2014, indicating a gross margin improvement of ...bps to ....% in the period. This significant improvement… was mainly due to the margin expansion in the Russian operations, contributed by the network optimization programme and further cost cutting initiatives, as well as higher volumes leading to lower per liter fixed costs”. Regional beer production, ths. dal. In 2013 the malt production by Russian enterprises fell by .% to .... thousand tons. Such negative dynamics was in general at the level with the beer market decline, but looks very low against the background of the rite growth by ....% in 2012. Obviously, the volumes of 2012 compensated the malt deficit, which formed due to poor crop of 2009 and 2010. That is why in 2013, the malt output was already influenced by rapid decline of the beer production. Besides, according to Rosstata data, the malt deliveries which reflect the trade volumes fell by ....% to ..... thousand tons, while in 2012 they grew by ....%. The deficit of qualitative malt, which appeared three years ago, resulted in growth wave of foreign deliveries. In 2011 the import volume slightly decreased, and the main expensive malt supplier was Finland, while Belarus sold more affordable malt. In 2012 these countries were joined by many countries of the EU. They still dominated the market in 2013. By the end of 2013, the malt import to Russia decreased by ..% to .... thousand tons. Germany became the leading supplier having replaced Finland in the leaders’ list. However, over the recent years, Russian producers have preferred to import barley rather than malt and to process it on their own (see below). The malt export from Russia in 2013 fell by ... times, to .... thousand tons, which is connected mainly to the sharp decline of deliveries to Armenia, which used to be the major buyer of the raw materials in 2012. Interestingly, in 2011 the same amount of malt was delivered to UAE, that is, the key buyers have been changing over the recent years. Basing on the shipments data and the custom statistics, one can define the dynamics of the trade balance. By the end of 2013, it shrank by ...% to .... thousand tons. The volumes of the malting barley sales from Russian agricultural producers reflect the situation on the raw material market. A volume decline by ..% to ..... thousand in 2013 can be explained by excess volumes in 2012, coupled with the lower demand from malt producers. Kursk region became the sales leader, as own agricultural projects are developed by holding branch Russkiy Solod and by company Kurskiy Solod, that bought a malt house from AB InBev branch, which stopped its operation, as well as many independent agricultural producers. Obviously, the company not only provided for its own needs by the gathered volumes of brewing malt but also was able to sell the excesses. However, other regions in Black Earth area, on the contrary, cut their malt sales. In particular, the general sales volumes were considerably influenced by the performance in Voronezh and Lipetsk regions. Though Russian producers significantly increased the volumes of sold malting barley in 2012, till the active selling of new harvest grain, market was much impacted by import barley. That is why, by the end of 2012, barley deliveries from far abroad countries grew by ....% to ... thousand tons. Ant the average contract prices for malting barley reached their peak ($... for a ton) in the second quarter of 2012. Arrival of the new harvest to the market and its saturation in 2013, accordingly, led to … decline of foreign deliveries, i.e. to ... thousand tons. The average prices fell too, from $... for a ton in the first quarter of 2013 to $... in the fourth one. Argentina was the key barley supplier in 2012, having a ..% import share (... thousand tons at $... for a ton). Another significant supplier was France, which provided ..% of the import (.. thousand barley tons at $... for a ton). In 2013, against the background of import decline, its structure was completely changed in favor of Scandinavian suppliers traditional for Russia. Nearly ..% of malting barley was bought in Denmark (... thousand barley tons at the average price of $... for a ton). Next ..% of import came from Sweden (.. thousand barley tons at the average price of $... for a ton). In the first quarter of 2014, the dollar rate grew by ..% against the 2013 average. Accordingly grew the prices in rubles. Early in 2014, against the background of rather slack trade, the average price for malting barley also grew to $... for a ton (nearly .. ... rub for a ton). The contracted price for import barley is nowadays not much higher than the average price of Russian barley. In the first quarter of 2014, malt producers bought malting barley at the average of .. ... ruble. Russian and foreign markets are now experiencing situation when prices for the harvest 2014 will be much influenced by already built stocks of qualitative raw materials. Besides, due to the lingering decline of beer production volumes, supply exceeds the expected demand. However, there has formed a considerable price difference between different purpose barley, among other reasons due to the sharp price decline of feed grain, which can encourage agricultural producers to grow malting barley. The price of Russian malting barley varies considerably from region to region. The highest buying prices are fixed in the regions where the malting barley is not grown and transport costs are particularly big. For example, in the first quarter of 2014, malt producers in the Sakhalin were buying grain at the price of more than .... thousand rub for a ton an at the end of 2013 the prices reached .... thousand rub for a ton. In Irkutsks, Sverdlovsk, Kaliningrad oblasts and the Primorsk Territory the average price for a malting barley ton in 2013 and early in 2014, comprised nearly .. thousand rub. Besides, Novosibirsk oblast and the Khabarovsk Territory also had higher than average prices. At the same time, there are several regions, which are situated not far from the areas where malting barley is grown, but buy it at high price. Obviously, it is caused by high demands for malt quality and brewing of licensed beer sorts. For example, Saint Petersburg purchased malt at the average price of .... thousand rub. Republic Bashkortostan and Tatarstan, where Efes breweries are located as well as Nizhniy Novgorod oblast, where the biggest Heineken brewery is located, were also buying malting barley a rather high price. Buying prices for malting barley in the regions where Baltika plants are located, varied considerably, but in general were at the level with the average for Russia price. Relatively low purchasing prices for barley are recorded in the regions where AB InBev breweries are located. To get the full version of this article propose you to buy it now ($80) or visit the subscription page. 2CheckOut.com Inc. (Ohio, USA) is an authorized retailer for goods and services provided by Journal.Beer (Pivnoe Delo, Ltd.).